It is widely acknowledged that people living with HIV understand one another’s circumstances better than anyone else and that they are often best placed to support one another. This idea is known as the GIPA principle (Greater Involvement of People Living with HIV and AIDS). And the GIPA principle forms the backbone of the work of Positive Heroes. We play a critical role in first identifying Heroes and then by involving them in a wide variety of activities at various levels . Our Heroes appear on posters, in local and national media, on websites. They take part in HIV/AIDS educational and awareness programs in schools, institutions and communities. They work at a grass-roots level within their home communities. Becoming actively involved as an integral part of the solution – rather than being seen as the problem. Through this exposure, our Heroes become familiar, well-loved faces that encourage people to explore the issues around HIV openly and freely. The Heroes real-life, up-beat and personal demonstration demonstrates that people living with HIV can as live long happy and healthy life as anyone else. Allowing them to balance the fear that surrounds HIV with hope. We are delighted that during our last financial year (to February 2011) the rate of advertising value equivalent (AVE) obtained in ratio to total organizational expenditure on all our activities was 26:1 (9:1 in 2010 and 6:1 in 2009). This measures the value of media coverage Positive Heroes created (R6.2million) compared to the total money spent by the organization on all our activities (R241k). This result is beyond wildest expectations and has given us fresh impetus to do even more to promote an acceptance of HIV and diminish fear, shame, stigma and discrimination. Positive Heroes Stories in Move! We have a long-standing relationship with Move! magazine – a rewarding and inspiring partnership that tackles HIV in South Africa through the stories of every-day citizens. Every six weeks Move! 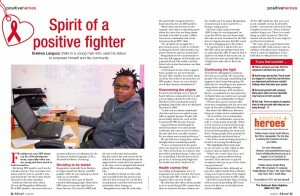 feature one of our Heroes, living positively with HIV – and tells their story. Move! reaches upwards of 1.85million readers in South Africa each week, and they are dedicated to tackling the issue of HIV/Aids in a hopeful and optimistic way. So, we have joined forces and, nine times a year, our Heroes tell their stories across a full colour double page spread in the magazine. The stigma surrounding HIV often keeps a person from asking others for help, keeps them isolated and untreated, stops them taking medication. Positive Heroes receives hundreds of emails and letters a month, through our website. Often in response to issues raised in a Move! magazine story. Or, as a response to other media interest. These requests for help, information, support and human contact come from people either newly diagnosed with HIV or people confronting some of the struggles of living with the virus. We answer every request individually. Sometimes the person needs more. Sometimes they need to hear a voice. To speak with another person who truly understands their situation – a person who is also living with HIV. So we ask our Heroes to call and “just chat”. Cell C have joined this conversation! They have generously supplied Positive Heroes with 11 Cell C phones equipped with monthly airtime so that the Heroes can continue to talk. This year already, their voices have stopped two people from harming themselves. Together Cell C and our Heroes are literally life-savers. And this is only the start. We hope to grow this initiative with our partners at Cell C through 2012 and 2013.